We chose two representatives from each class and had all the school in the hall at the same time. The two children from each class (5 classes in all) were timed in front of everyone and we all counted down the final 10 seconds. It was a very enjoyable event. Our final total is £520, not bad for a small school! We gave out prizes for the most stylish dresser and the speediest (44 items in 5 minutes by a Year 6 girl!). 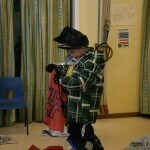 Altogether it was a very successful, popular event which the children really got behind and supported. I think as there are already existing links with Cyrilyn the children were enthused and keen to support.